The holiday house is located in the woody hamlet Spicke on a slope. The house has two floors with two bedrooms, a living room and a small kitchen with direct adjoining large dining area. The upper large bedroom has a double bed, the small lower one has two single beds. The living room also has a sleeping sofa (160-200 cm). From the dining area you reach a large terrace. Due to the steep slope of the nature plot, the house and grounds have a special charm. Surrounded by tall old trees, one feels in the middle of nature and sees and hears nothing from the neighbors. However, you have to climb stairs in the house as well as in the garden. The house is therefore not suitable for people with walking disability. Dog lovers are always welcome with their four-legged friends and find a true dog paradise here. 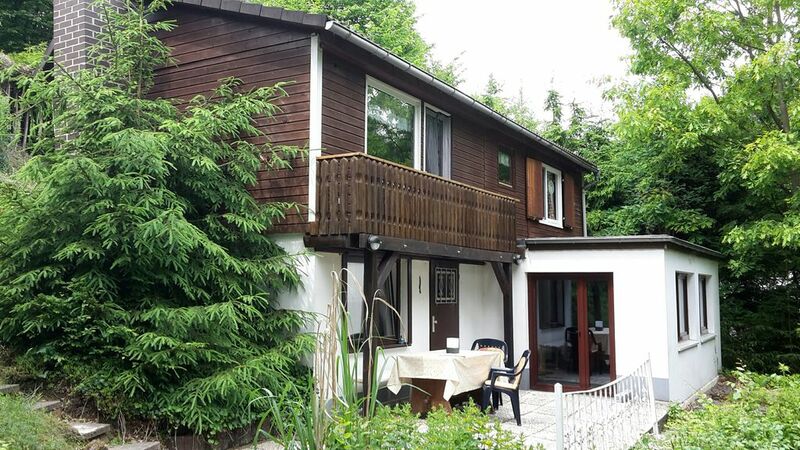 On the property is also a log cabin with a second terrace with a wonderful view of the forest. Garden furniture for both terraces are available. Two mountain bikes can be rented for bicycle tours. There is a parking lot in front of the entrance gate. Guests can also park on a separate parking lot below the settlement. The house is designed for two to four persons. We very much enjoyed our stay at this lovely situated house on a hillside. Wir waren zu dritt mit Hund über Silvester im kleinen Fuchsbau zu Gast. Das Ferienhaus ist gut ausgestattet, insbesondere in der Küche finden sich genug Geschirr, Besteck und Töpfe. Wohn- und Essraum sind gemütlich und wir haben uns wohl gefühlt. Wunderbar fanden wir auch, dass man direkt vom Haus aus Wandern kann. Kommunikation mit Herrn Pott war schnell und sehr freundlich. Wir haben den Urlaub dort sehr genossen. Die Optik des Hauses fügt sich passend in die Landschaft...sehr ruhige Lage am Waldrand. Die Zimmer sind sauber und sehr gepflegt. Man sieht die liebevolle Einrichtung. Vieles ist neu gestrichen oder neu eingerichtet worden. Es fehlte an nichts. Das Preis- Leistungsverhältnis ist top. Das Häuschen in Hanglage hat seinen gewissen Charme. Man hat das Gefühl mitten im Wald zu wohnen, es ist einfach Erholung pur vom ersten Moment an. Die Ausstattung ist sehr gut, es hat an nichts gefehlt. Wir zwei haben das sehr genossen - die Ruhe, die grosszügige Ausstattung und vor allem die Naturlage des "Kleinen Fuchsbaues". Man muss schon ordentlich rauf und runter und den Steilpfad nach ganz unten auf den Kesselbachtalweg haben wir nicht genommen (da Seil und Haken zuhause geblieben waren) - aber wir können dieses Häuschen uneingeschränkt für Naturinteressierte, Kulturinteressierte, Wanderer und Biker (das hat geklappt, 1 Bike im Schuppen lies sich flott machen!) - und ins Oberhessische Bergland Verliebte empfehlen. Sehr geschmackvoll eingerichtetes Ferienhaus in schöner Lage. A few meters away from the holiday house you will find the recreational area Spicke.